The present invention comprises a novel and safer mechanism of deployment using a self- positioning, self-centering, and self-anchoring method. To embody the present invention, a disk-based valve apparatus allowing the repositioning and retrieval of the implantable valve while working on a dysfunctional valve structure is disclosed. The disk-based valve apparatus may comprise one or more disks, either proximal or distal, a valve-housing component and a valve component. The one or more disks may be either proximal or distal, may be either connected to each other or disconnected from each other and may either be symmetrical or have different shapes and dimensions. The disk-based valve apparatus may be self anchoring, such as anchored by pressure from the one or more disk, or may be anchored using any anchoring. The present patent application claims the benefits of priority of commonly assigned United States of America Patent Application No. 61/454,703, entitled "Multiple Disk Self- Positioning Apparatus and Method for the Treatment of Valve Dysfunction" and filed at the United States Patent and Trademark Office on March 21, 201 1. The present invention generally relates to valve implantation and more specifically to the percutaneous replacement of dysfunctional valves. In addition to the initial commercially approved devices for transcatheter aortic valve implantation (TAVI) such as the Edwards-Sapien™ THV balloon expandable bovine bioprosthesis (Edwards Lifesciences INC, Irvine, CA, USA) and the Core Valve ReValving® System (Medtronic Inc., Minneapolis, MN, USA), nitinol porcine self- expanding bioprosthesis, a number of newer devices have also recently been CE marked for use via the transapical route. These are the Symetis Acurate (Symetis, Lausanne, Switzerland) and the Jena Valve (JenaValve, Munich, Germany) that are described below in the text..
 Several valves for TAVI are currently at an early stage of pre-clinical or clinical evaluation. Referring to Table 1, in general, new valves incorporate features aiming to reduce delivery catheter diameter, facilitate accurate positioning, reduce para-valvular leaks, or allow device retrieval. In the following paragraphs we will describe some of the publicly known programs. The Direct Flow Medical Aortic Valve, developed by Direct Flow Medical Inc., USA and shown by D in Figure 1, is a stent-less, non-metallic, expandable device that consists of bovine pericardial leaflets sewed to a Dacron fabric cuff, with an inflatable ring on the aortic side and another on the ventricular side, designed for trans-femoral delivery. Once the valve is positioned, the rings are inflated with saline and contrast until the position and function of the valve has been confirmed. The diluted contrast is then exchanged for an active polymeric medium that, following polymerization, hardens and forms the final support structure. The Lotus Valve System developed by Boston Scientific Inc., USA, as shown by Figure 1, is a bioprosthesis consisting of three bovine pericardial leaflets suspended in a self-expanding and self-centering braided nitinol stent frame. It has an active shortening- locking mechanism and an external polyurethane sealing membrane to prevent para- valvular leaks. In the delivery catheter the stent it is in its longitudinal form, with low radial force and small profile. Once the valve has been positioned and the outer catheter is retracted, the prosthesis expands radially, gaining radial force and losing height, effectively locking the valve in place. The valve is designed for trans-femoral delivery. The Heart Leaflet Technologies ("HLT") valve, developed by Heart Leaflet Technologies Inc., USA, and as shown by A in Figure 1, is a porcine pericardial trileaflet valve mounted in a self-inverting nitinol cuff, with 3 nitinol support hoops and with an antireflux collar, designed for trans-femoral delivery. The JenaClip, developed by Jena Valve Technology GmbH, Munich, Germany and shown by C in Figure 1, is a bioprosthetic pericardial tissue valve mounted in a self- expanding nitinol stent, as known as the JenaClip, that is built up of 2 layers of "paper clip-like" structures (3 in each layer) that are compressed in a dedicated delivery catheter. It has been designed anatomically to fit in the sinuses of Valsalva with a clip- based anchoring system 20. It is designed for both trans-femoral and trans-apical delivery and recently had CE mark for the transapical route. The Engager valve, formerly developed by Ventor, recently acquired by Medtronic, Minneapolis, MN, and shown by H in Figure 1, is a self-expandable pericardial-tissue prosthesis with a composite nitinol proprietary frame. The outer frame has a crown-shape, with troughs that flare out to anchor the valve in the sinuses. An inner frame has an hourglass shape and is designed to minimize pressure loss at inlet and maximize pressure recovery at outlet, and thereby optimizing fluid dynamics (based on the Venturi effect). This device is specifically dedicated for trans-apical delivery, but more recently a trans-femoral version has been developed. The AorTx Device, developed by Hansen Medical Inc, Mountain View, CA and shown by F in Figure 1, is a suture-less prosthesis that consists of a pericardial-tissue valve attached to a self-expanding, solid nitinol frame. This frame is folded before deployment. It is repositionable and retrievable. This valve has been designed for both trans-apical and femoral approach through an 18F delivery system. The ATS 3f Series, developed by ATS Medical, Minneapolis, MN and shown by E in Figure 1, is a self- expandable bioprosthesis mounted in a tubular nitinol frame designed for surgical (ATS 3f Enable) and percutaneous (ATS 3f Entrata) deployments. Six sizes are available, from 19 to 29 mm. The Perceval-Percutaneous, developed by the Sorin Group, Milan, Italy and shown by G in Figure 1 is a self-expandable bovine pericardial valve with a nitinol panel frame matching the anatomy of the aortic root and sinuses of Valsalva. It has a double sheath that provides enhanced sealing and non-expandable support rods. [001 1] The Bailey-Palmaz Perc Valve, developed by Advanced Bio Prosthesis Surfaces, Ltd. San Antonio, TX (not shown) is a completely mechanical valve consisting of a monolithic structure of nanosythesized nitinol in a self-expanding cage and nitinol leaflets that also has a nitinol membrane at the base of the valve to reduce paravalvular regurgitation. This new nanosynthetic material has improved stress and fracture resistance and has allowed for a device with a smaller profile, which can be delivered through a 10F sheath. It is designed to be repositionable and retrievable, and to be delivered by retrograde, antegrade, or transapical approach. The Paniagua Heart Valve, developed by Endoluminal Technology Research, Miami, FL and shown by H in Figure 1, is a biologic valve having a collapsed profile of 2 mm that must be manually crimped on to a delivery balloon, but that also exists as a self- expanding model. It can be inserted through a 10F to 18F sheath, depending on the mounting frame and the final valve diameter. This valve was designed to be used in any heart valve position. Symetis Acurate valve (Symetis, Lausanne, Switzerland) is a self-expanding nitinol stent has also recently been CE marked for use via the transapical route. The valve is porcine with the stent allowing anchorage via an upper and lower crown along with 3 stabilization arches in a subcoronary position, believed to be the 'anatomically correct' position. It is available in 3 sizes: 23 mm, 25 mm and 27 mm, with the ability to be planted sheathless (28 Fr equivalent). The transfemoral version is currently undergoing pre-clinical studies. Recently, new techniques have been developed to treat mitral regurgitation ("MR") with percutaneous approach, in order to restore valve function without surgical incision and cardio-pulmonary by-pass. Recently a new classification of percutaneous MVR technologies on the basis of functional anatomy grouping the devices into those targeting the leaflets (percutaneous leaflet plication, percutaneous leaflet coaptation, percutaneous leaflet ablation), the annulus (indirect: coronary sinus approach or an asymmetrical approach; direct: true percutaneous or a hybrid approach), the chordae (percutaneous chordal implantation), or the LV (percutaneous LV remodeling) has been proposed, as shown in Table 2. This technology is based on the surgical Alfieri technique which brings the anterior and posterior leaflets together with a suture, creating a "double orifice" MV. This re-establishes leaflet coaptation, thereby reducing MR.
 As example, the MitraClip system, developed by Abbott Vascular, Santa Clara, California, uses a steerable catheter to deliver a clip to the anterior leaflet and posterior leaflet via trans-septal access. The EVEREST I, developed by Endovascular Valve Edge- to-Edge REpair Study, which was a safety and feasibility study assessing this device has been recently published. Data from the EVEREST II study, randomizing Mitra- Clip versus surgical repair, were recently presented. The device is currently CE marked and used in clinical practice in Europe. Also, the MitraFlex, developed by TransCardiac Therapeutics, Atlanta, Georgia, which deploys a clip to the leaflets via the transapical route, is undergoing pre-clinical testing (this device also allows an artificial chord to be implanted during the same procedure). Radiofrequency energy is delivered to the leaflet(s) to effect structural (fibrosis) or functional (reduced motion) alteration. The device acting is positioned across the MV orifice to provide a surface against which the leaflets can coapt, reducing MR.
 As example, the Percu-Pro device, developed by Cardiosolutions, Stoughton, Massachusetts, consists of a polyurethane-silicone polymer space-occupying buoy that is anchored at the apex through the MV acting as a "spacer" in the mitral orifice. A trans- septal approach is required to implant the anchor in the apex. A phase 1 trial is on going. This approach mimics surgical annuloplasty rings, which are commonly used for repair of both degenerative and functional MR.
 Coronary Sinus ("CS") Approach: This approach involves implantation of devices within the CS with the aim of "pushing" the posterior annulus anteriorly, thereby reducing the septal-lateral (anterior-posterior) dimension of the MA. As example, the Monarc (previously Viking) system developed by Edwards Lifesciences consists of an outer guide catheter, a smaller delivery catheter, and a nitinol implant. The implant has 3 sections: distal and proximal self-expanding anchors, and a springlike CS and distal great cardiac vein closer, indirectly displacing the posterior annulus anteriorly. The phase 1 trial (Evolution) has been completed. Evolution II study is ongoing. As another example, the Carillon Mitral Contour System, developed by Cardiac Dimension, Inc., Kirkland, Washington, consists of self-expandable nitinol distal and proximal anchors connected by a nitinol bridge that are placed in the great cardiac vein and proximal CS via a catheter-based system. Tension applied on the system results in cinching of the posterior periannular tissue and deflection of the posterior MA anteriorly. A feasibility study showed modestlyreduced septal-lateral dimension and MR .The AMADEUS trial (CARILLON Mitral Annuloplasty Device European Union Study) using themodified CARILLON XE device (Cardiac Dimension, Inc.) has been conducted. As a further example, the Viacor percutaneous transvenous mitral annuloplasty device, developed by Viacor, Inc., Wilmington, Massachusetts, uses nitinol rods of varying length and stiffness, delivered via a catheter to the CS. Asymmetrical Approach: This group of devices uses the proximity of the CS to the annulus to try to reshape the mitral anulus ("MA") but in addition exert traction force on another portion of the left atrium ("LA") or right atrium, resulting in asymmetrical forces. The aim is to reduce septal-lateral dimension and decrease MR.
 As an example, St. Jude Medical, based in Minneapolis, Minnesota, implanted in animal models comprising 4 helical anchors, 2 loading spacers, a tether rope, and a locking mechanism. The distal pair of anchors is delivered via the CS into the LV myocardium near the posterior leaflet scallop. The proximal pair is implanted via the right atrium into the postero-medial trigone. The 2 pairs of anchors are connected by a cable to effect cinching of the postero-medial MA. Dynamic shortening can be performed manually and reversibly, and the docking mechanism is a self-retracting, nitinol structure that maintains cinched load. Also, the National Institutes of Health cerclage technology directs a guidewire via the CS into the first septal perforator of the great cardiac vein and, under imaging, across the myocardium to re-enter a right heart chamber. It is ensnared and exchanged for a suture and tension-fixation device. Percutaneous Mechanical Cinching Approach: This technology reshapes the MA directly without using the CS, approaching the MA from the LV or the LA side. Sutures or some other device are implanted onto the MA itself and used to directly "cinch" the MA. Devices. As an example, the Mitralign device, developed by Mitralign, Tewksbury, Massachusetts, gains access to the annulus from the transventricular approach. Anchors are placed directly on the posterior MA and connected with a suture, creating a "purse- string" tocinch the MA. As another example, the Accucinch Annuloplasty System, developed by Guided Delivery Systems, Santa Clara, California, uses a transventricular approach. The posterior annulus is cinched circumferentially from trigone to trigone  As a further example, the Millipede system, developed by Millipede, LLC, Ann Arbor, Michigan, involves placement of a novel repositionable and retrievable annular ring with a unique attachment system via percutaneous (transseptal) or minimally invasive methods. Percutaneous Energy-Mediated Cinching Approach: Heat energy is applied to the MA, causing scarring and shrinkage of the MA. As an example, QuantumCor, developed by QuantumCor, Lake Forest, California, effects direct annuloplasty by use of radiofrequencyenergy to cause scarring and constriction of the MA. It has a loop tip that contains electrodes and thermocouples to regulate the amount of energy delivered. Also, ReCor device, developed by ReCor, Paris, France, delivers high intensity focused ultrasound circumferentially and perpendicularly to the catheter shaft to induce tissue heating and collagen (and thus MA) shrinkage. Hybrid Approach: An annuloplasty ring is implanted surgically and can be subsequently adjusted via transseptal access if MR recurs or worsens. Also, Dynamic annuloplasty Ring System, developed by MiCardia, Inc., Irving, California, is adjusted with radiofrequency energy. Synthetic chords or sutures are implanted either from a transapical or transseptal approach and anchored onto the LV myocardium at one end, with the leaflet at the other. The length of the chord is then adjusted to achieve optimal leaflet coaptation, as exemplified by the following devices, the MitraFlex, developed by TransCardiac Therapeutics, and the NeoChord, developed by Neochord, Inc., Minnetonka, Minnesota. The MitraFlex and Neochord devices place an anchor in the inner LV myocardium and another on the leaflet via a transapical approach and connect both with a synthetic "chord" trough trans-apical approach. Babic is based on continuous suture tracks created from the LV puncture through the puncture of the target leaflet and are exteriorized via the trans-septal route. A pledget is apposed onto the exteriorized venous sutures and anchored onto the atrial side of the leaflet by retracting the guiding sutures from the epicardial end. A polymer tube is then interposed between the leaflet and free myocardial wall and secured at the epicardial surface by an adjustable knob. A device is used to reduce the anterior-posterior dimension of the LV. This indirectly decreases the septallateral annular distance and also brings the LV papillarymuscles closer to the leaflets. The Mardil-BACE, developed by Mardil, Inc., Morrisville, North Carolina, is a silicone band that is placed around the atrioventricular groove with built-in inflatable chambre placed on the MA. This reshapes the MA for better leaflet coaptation and can be remotely adjusted after implantation. It requires a mini-thoracotomy but is implanted on a beating heart. FIM is on going. 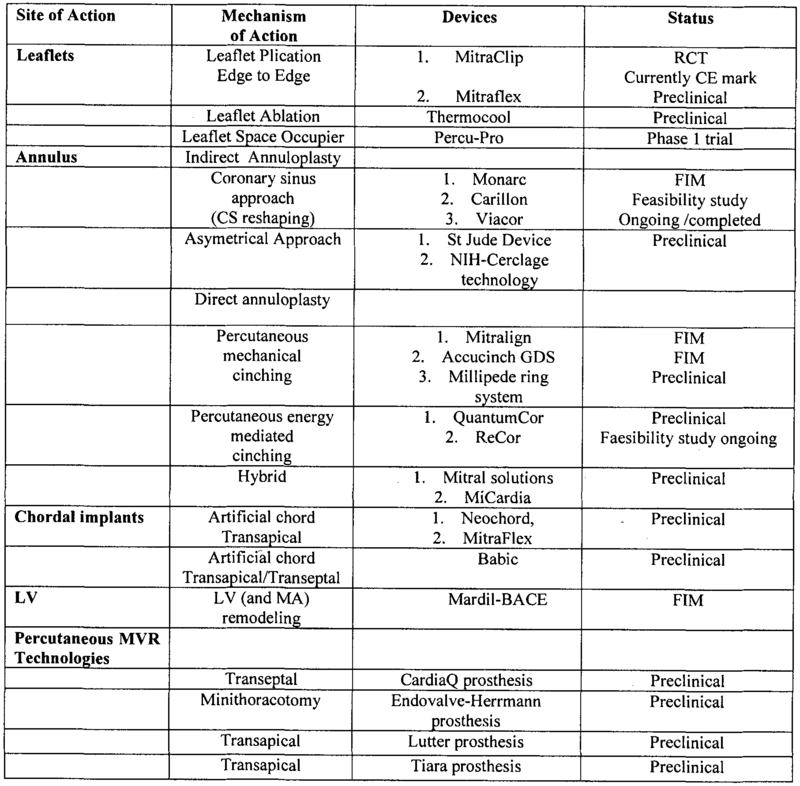 At present time, different devices, such as CardiaAQ, Endovalve ,Lutter, Tiara for transcatheter mitral valve replacement therapy using antegrade, transvenous, trans-septal, catheter-based approach are under development. To our knowledge, they are all in the early stages of design and development and have not been approved for clinical use, and in some of them animal studies are on going. The challenges are formidable: the MA has an asymmetrical saddle shape, and different anchoring designs might be necessary for different MR etiologies. LV out flow obstruction might occur due to retained native valve tissue. Furthermore paravalvular leaks might also pose a problem. In all these devices different concepts of anchoring system 20 have been developed to achieve a stabilization of the valve: anchoring below the annulus through hooks (CardiaAQ), subvalvular fixation toward mitral chord or with anchoring in the annulus with movable leaflets (Endovalve) in a nitinol self expanding tubular frame. As an example, the CardiAQ, developed by CardiAQ Valve Technologies, Inc., Winchester, Massachusetts, prosthesis (Figure B) is delivered transseptally and locks into the inferior and superior surfaces of the mitral annulus. Animal models have been successful. Also, the Endovalve- Herrmann prosthesis, developed by Endovalve Inc., Princeton, New Jersey, is implanted from the LA side via a right mini-thoracotomy on a beating heart , as shown in Figure 3, The device is a foldable nitinol structure that attaches to the native valve with specially designed grippers, is fully valve sparing, and repositionable before release. Animal models have been successful, and a true percutaneous version is planned. The Lutter prosthesis, a nitinol stent-valve, implanted transapically. It comprised of a left ventricular tubular stent with star shaped left atrial anchoring springs and a trileaflet bovine pericardial valve. The Tiara (Neovasc, Richmond, BC, Canada) prosthesis, is a nitinol stent valve, implantable transapically. Animal models have been successful, and a true percutaneous version is planned. As described above, the mitral valve apparatus has multiple components and displays a complex anatomical shape and structure thus limiting the number of any prevailing mitral valve repair solutions. The mitral valve technologies currently under development are actually composed of rigid valve structures, which usually distort the mitral valve plane and apparatus with unknown clinical results. Thus, there is a need for improved designs, which are conforming better to the mitral valve geometry as to keep a physiologic mitral inflow plane following valve apparatus implantation. In regards to the percutaneous valves under development, several issues need to be considered. Balloon expandable structures depend on permanent plastic deformation induced by device expansion to a specific diameter and length. Although commonly used for treating calcified aortic stenosis, these structures are not proper fit for non-symmetrical shapes such as the mitral valve. Often resulting in para-valvular leaks following device implantation, symmetrical balloon geometries are not ideal. Although, self-expanding structures are an improvement over balloon expandable ones, a one-piece structure in a symmetrical upper and lower part of mitral valve apparatus is not ideal either. Different radial pressures might be needed against surrounding tissue potentially causing deleterious effects such as conduction system disturbances or tissue disruption. The self-positioning singular or multi-disk concept may improve upon the aforementioned limitations by securing the leaflet in between disks of different radial force, aligning a prosthetic valve to blood inflow angle and avoiding dislodgment through anchoring at the base of the mitral valve apparatus. One of the objects of the present invention is to allow the implant of a valve concept in the region of a dysfunctional valve structure. A further object of the present invention relates to the treatment of valve insufficiency. Furthermore, it is also an object of the present invention to use the valve apparatus to replace or treat a stenosed valve. Other and further objects and advantages of the present invention will be obvious upon an understanding of the illustrative embodiments about to be described or will be indicated in the appended claims, and various advantages not referred to herein will occur to one skilled in the art upon employment of the invention in practice. The aforesaid and other objectives of the present invention are realized by generally providing at least one disk with self-positioning, self-centering, and self-anchoring valve apparatus. In embodiments having a plurality of disks, the apparatus may be built as an assembly of independent self-positioning, self-centering, and self-anchoring components assembled into a single valve apparatus assembly. The disk-based valve apparatus comprises multiple components of different shapes and configurations acting as separate and independent anchoring system and allowing self- positioning and centering of a valve-housing component, as a generally median or central waist, containing the valve component. The disk-based valve apparatus comprises one or more disks, a valve-housing component and a valve component. The one or more disks may comprise one or more notch or gap. The one or more disks may be either proximal or distal, may be either connected to each other or disconnected from each other and may either be symmetrical or have different shapes and dimensions. The disk-based valve apparatus may be self anchoring, such as anchored by pressure from the one or more disk, or may be anchored using any anchoring mechanism such as but not limited to, needles, hooks, prongs, struts, helical configurations or any other fixation mechanisms. The disk-based valve apparatus comprising one or more disks allows the repositioning and retrieval of the implantable valve while working on a dysfunctional valve structure. The present invention comprises a novel and safer mechanism of deployment using a self-positioning, self-centering, and self-anchoring method. The valve apparatus, comprising one or more disks, dependently or independently interacting with each other, is maintained in place by the anchoring of the proximal and/or distal disks. Such mechanism allows the self-positioning, self-centering, ad self-anchoring of the valve, thus, maintaining the overall inflow plane of native valvular apparatus. Furthermore, the valve apparatus comprises a double structure having a valve- housing component. The valve-housing component allows the device to be uniquely shaped and to distinguish from all other disk-based valve apparatus. Additionally, the particular shape and configuration of the distal disk ease the distal anchoring of the device. On the other end, the proximal disk facilitates the centering and stability of the valve apparatus. Figure 1 presents a side view of the internal component of the valve-component housing of a multi-disk self-expanding valve apparatus in accordance with the present invention. Figure 2 depicts the view from the distal disk of a disk-based valve apparatus in accordance with the present invention in relationship with the mitral valve anatomy. Figure 3 depicts the view from the distal disk of a disk-based valve apparatus in accordance with the present invention, the distal disk having a cross-like shape and being shown in relationship with the mitral valve anatomy. Figure 4A is a scaled bottom view of a multi-disk self-expanding, self-positioning and self-anchoring valve apparatus in accordance with the present invention. Figure 4B is a scaled top view of a multi-disk self-expanding self-positioning and self-anchoring valve apparatus in accordance with the present invention. Figure 4C is a scaled side view of a multi-disk self-expanding self-positioning and self-anchoring valve apparatus in accordance with the present invention. Figure 4D is a perspective view of a single-disk self-expanding self-positioning and self-anchoring valve apparatus in accordance with the present invention having a petal shaped proximal disk and anchoring mechanisms on the ventricular side. Figure 4E is a perspective transversal view of single-disk self-expanding self- positioning and self-anchoring valve apparatus in accordance with the present invention having a petal shaped proximal disk, anchoring mechanisms on the ventricular side and showing the valve component. Figure 5A is a perspective view of a multi-disk self-expanding self-positioning, and self-anchoring valve apparatus in accordance with the present invention comprising two disks being connected to each other or a single component shaped into a proximal and distal disk. Figure 5B is a perspective view of a multi-disk self-expanding, self-positioning, and self-anchoring apparatus in accordance with the present invention comprising independent and disconnected disks. Figure 6 is a perspective view of a multi-lobe self-expanding, self-positioning, and self-anchoring valve apparatus in accordance with the present invention comprising multiple independent units. Figure 7 is a perspective view of a single-disk with multi-lobes self-expanding, self- positioning, and self-anchoring valve apparatus in accordance with the present invention comprising wiring with teardrops end as anchor system. Figure 8A is a perspective view of a single-disk self-expanding, self-positioning and self-anchoring valve apparatus in accordance with the present invention having a petal shaped proximal disk and comprising an anchoring system using hooks. Figure 8B is a perspective view of a caged anchoring mechanism using hooks. Figure 8C is a perspective view of an anchoring mechanism using hooks. A novel self-expanding, self positioning, and self-anchoring valve apparatus and method for the treatment of valve dysfunction will be described hereinafter. Although the invention is described in terms of specific illustrative embodiment(s), it is to be understood that the embodiment(s) described herein are by way of example only and that the scope of the invention is not intended to be limited thereby. Referring to Figures 1 , 5 A and 6, the apparatus 10 comprises a self-expanding, self- positioning and self-centering valve apparatus comprising at least one disk, a valve-housing component 50 referred to as central waist, an anchoring mechanism 20, and a valve component 30. In some embodiment, a cuff material 40 is inserted within the frame to direct the blood flow through the valve and not around it. Generally, the valve apparatus 10 may be made from a self-expanding material, such as, but not limited to Nitinol. The valve- housing component 50 comprises one or more self-positioning components such as different materials and different configurations to form the valve housing 50 where the valve 30 is located. Still referring to Figures 1, 5 A and 6, the anchoring mechanisms 20 with its proximal 21 and distal 22 components are made from materials allowing minimal deformation during heartbeat movement. Such material could be metallic or polymeric and not limited to stainless steel, nitinol, PEEK, etc. In a preferred embodiment, the disk material should be superelastic allowing a collapsed form for delivering the device and resuming its memorized configuration upon deployment at the implantation site. Materials having intrinsic memory such as Nitinol are preferable. However, any other metals and materials, such as memory-shape polymers, could also be used to manufacture or make the anchoring system 20. The valve component 30 is attached to the inner part 24 of the valve- housing component 50. It should be noted that the disk-based, self-expanding, self-positioning, and self- anchoring valve apparatus, such as anchored by a cinching pressure force due proximal and distal disks shortening toward each other, or may be anchored using any anchoring mechanism such as but not limited to, needles, hooks, prongs, struts, helical configurations or any other fixation mechanisms. It should be noted that within the description of the present invention, the proximal term refers to the ventricular portion while the distal term refers to the atrial portion of the valve apparatus 10. However, if valve apparatus 10 is described or installed from the atrial to the ventricular portion, the proximal term shall refer to the atrial portion and the distal term shall refer to the ventricular portion. Typically, the anchoring system 20 comprises an atrial anchor 21 and a ventricular anchor 22. The ventricular anchor may comprise at least one notch or gap 23 to clear the aortic outflow track and the sub-valvular apparatus for instance. Now referring to Figure 5A, the disk-based valve apparatus 10 may be configured to adapt to a patient specific anatomical needs. Although depicted longer for representation purpose in Figure 5A, the valve-housing component 50 is designed to exert a radial force against the mitral valve and sub-valvular apparatus, while the upper 62, and lower 61 disks are compressing the native mitral valve. These compression forces allow self-anchoring and natural positioning of the valve concept in place. Typically, the frame of the apparatus 10 comprises a single valve-component housing 50, being covered 40 or uncovered unit or being a unitary component comprising an aperture 24 having a predetermined dimension and generally located within the central portion valve-housing 50. The frame may also comprise one or more independent units, such as the disks 60 shown in Figure 6 forming a continuous structure. In embodiments having a frame comprising a single unit, such as the embodiment shown in Figure 5A, all the components must be attached to allow longitudinal and axial compression of the apparatus 10. In another embodiment, the apparatus may comprise an inner aperture 24 such as a tubular aperture, as shown in Figure 6. In such an embodiment, the self-centering units 20 are depicted in a C-shape form allowing them to act as clips onto the mitral valve apparatus. The upper member 21 exerts a downwards self-anchoring force, while the lower member 22 exerts an upwards self-anchoring force. Now referring to Figure 2 and 4A, the distal disk 61 comprises an outer portion configured to allow deformation following contact with the dysfunctional valve or sub- valvular apparatus. The configuration of the distal disk61 may vary according to the patient's anatomy. Typically, the valve-component housing 50 comprises a tunnel-like structure 24 allowing a proper positioning of the replacement valve. The valve-component housing 50 comprises a tightly woven frame in order to provide proper radial strength and longitudinal stability to the valve apparatus 10. Referring to Figure 5B, in another embodiment, the valve-component housing 50 may be configured as an independent unit of the valve apparatus 10, thus, allowing a plurality of mechanisms of expansion, such as balloon-based, self-based, or injectable polymer within the structure to create as expansion mechanism, to be attached to the valve apparatus 10. Such expansion mechanism may reduce or decrease the risk of device embolization, peri-valvular leak and facilitate the use of the valve apparatus 10 in the event of stenotic valvular lesions. Typically, the height of the valve-component housing 50 may range from 0.5 cm to 2.5 cm. The longitudinal diameter of the valve-component housing may range from 1.5 to 6.0 cm. Now referring to Figures 5A, 5B, 6 and 7, the proximal disk 62 and distal disk 61 may have different shapes and configurations, such as, but not limited to, rounded, oval, multi-lobar or any shape covering the perimeter of the dysfunctional valve. Typically, the proximal disk 62 structure generally faces the proximal (inlet) valvular plan and the distal disk 61 is located within the distal (outlet) plane of the dysfunctional valve. The weave of the disks is generally more open or wider than the weave of the valve- component housing 50. The disks 61 & 62 have the aim to orient the anchoring system 20 and to keep the valve-component housing 50 in its position. In other embodiments, the disks 60 maybe shaped differently. A concave disk shape may be desirable in order to allow at least one portion of a disk 60 to stay in contact with the dysfunctional valve. Additionally, other anchoring mechanisms 20, such as but not limited to, needles, hooks, prongs, struts, helical configurations or any other fixation mechanisms may be used on a disk or on the distal or proximal portion of the valve apparatus 10. It shall be noted that the proximal disk 62 may configured to have a different dimension than the distal disk 61. Typically, the diameter of the proximal disk 62 ranges from 2.5 to 7.5 cm. In a preferred embodiment, the height of a disk 60, either distal 61 or proximal 62, shall be less than 0.5 cm. Following the installation of the apparatus 10, the distal disk 61 is compressed by a cords and sub-valvular apparatus. At this point, the distal portion of the disk 61 remains convexly shaped and is located above the papillary muscles. To correctly configure the distal disk 61 to the specific patient's anatomy, additional features may be required, such as hooks or anchors. In order to protect the sub-valvular apparatus and to provide enhanced valve anchoring capabilities, the distal disk 61 must be configured differently in regard to the proximal disk 62. More particularly, and as shown on Figures 3, 4A and 4B a distal disk 61 smaller than the proximal disk 62 may have a specific configuration, such as a "cross" or "star-like" configuration. Additionally, potential radio- opaque markers may be installed in order to allow the anchoring of the distal disk underneath the sub-valvular apparatus. Typically, the diameter of the distal disk 61 ranges from 2.5 to 7.5 cm. However, the height of the distal disk 61 should vary according to the dimension and shape of the sub- valvular anatomy. When implanted, the distal disk 61 may comprise one or more additional sub-valvular anchoring structure 20, such structure 20 allowing better apposition and fixation to the dysfunctional valve. The valve apparatus 10 may be completely or partially covered or laminated using different and/or independent material. Such covering may be installed or placed outside or inside of the structural cage 40 of the valve apparatus 10. The material use to cover or laminate the frame may be interwoven with the frame. Any type of valve component 30, such as biological valve or synthetic valve, may be used as a valve component 30 of the valve apparatus 10. A biological valve graft or synthetic valve may be sutured to the valve-component housing 50 of the anchoring mechanism 20. It should be appreciated by the one skilled in the art that any other mean of attachment of the valve component 30 to the valve-component housing 50 may be used. Typically, the valve component 30 is made of biological material or of synthetic tissues. A valve component 30 made from biological material may be homo or hetero graft. The valve component 30 may comprise two or more leaflets, wherein such leaflets are self-sealable due to the pressure gradient or difference between the atrium and the ventricle. A delivery system comprises a loading system, a catheter, a short and a long pusher wire. The catheter may be steerable in order to properly orient the system through the valve during the release phase. The delivery system is loaded on the pusher wire with an attachment method such as a screw or a bayonet. Once loaded, the delivery system is inserted and pushed to the tip of the catheter positioned in the ventricle. Following the insertion of the delivery system, the distal portion of the system is released in the ventricle and the catheter is retrieved to the atrio-ventricular plan. Consequently, the valve- component housing 50 is released and followed by the proximal portion. In a preferred embodiment, such as shown in Figure 5 A, a valve apparatus 10 comprising a single unit may be hollowed. The valve apparatus comprises a valve component in a generally central portion 50 and two disks 60, a proximal 62 and a distal 61. The apparatus may comprise at least one separate anchoring mechanism 20, as shown by the disks 21 and 22 but may be anchored using the pressure of the disks 60. Once the distal disk 61 is distally inserted within the patient's dysfunctional valve, the distal disk 61 is released in a distal orientation in regard to the sub-valvular apparatus. Upon deformation of the distal disk 61, the entire valve apparatus 10 is pulled back into the plane of the dysfunctional valve in order to position the valve component 30 located in the valve- component housing 50, as shown in Figures 3, 4, 5A and 5B. Once the first disk 61 positioned, the second disk 62 is released in order to secure the apparatus 10 in place. This configuration may be changed or adapted according to the route of insertion, such as anterograde versus retrograde or percutaneous versus trans-apical versus trans-atrial. In another embodiment, the valve apparatus 10, as a single unit, comprises a valve component 30 generally located in the valve-component housing 50 of the apparatus 10 and two disks 60, a proximal 62 and a distal 61. The apparatus may comprise at least one separate anchoring mechanism 20, as shown by the disks 21 and 22 but may be anchored using the pressure of the disks 60. When the insertion of the distal disk 61 is completed within the patient's dysfunctional valve, the distal disk 61 is released in a distal orientation in regard to the sub-valvular apparatus. The distal disk 61 comprises at least one additional anchoring structures 20, such as but not limited to needles, hooks, prongs, struts, helical configurations or any other fixation mechanisms. The at least one anchoring structure 20 allows the sub-valvular anchoring and positioning of the distal disk 61. Upon deformation of the distal disk 61. The valve apparatus 10 is pulled back into the plane of the patient's dysfunctional valve in order to position the valve component 30 located in the valve- component housing 50 of the apparatus 10. Once the distal disk 61 positioned, the second disk 62 is released in order to secure the entire cage in place. The configuration of this embodiment may be changed or adapted according to the route of insertion, such as anterograde versus retrograde or percutaneous versus trans-apical versus trans-atrial. In a further second embodiment, which is similar to the embodiment described above, the valve apparatus 10 comprises a single distal anchoring disk 61. When the insertion of the apparatus 10 is completed within the patient's dysfunctional valve, a distal disk 61 is released. At this point, the distal disk 61 is partially deformed and the valve-component housing 50 is positioned at the level of the dysfunctional valve plane. Then, the proximal segment of the apparatus 10 is fully released to complete the positioning of the valve apparatus 10. In a further third embodiment, which is based on the further second embodiment, the valve apparatus 10 comprises a single distal anchoring disk 61 and a smaller and shorter proximal disk 62. When the insertion of the valve apparatus 10 is completed within the patient's dysfunctional valve, the distal disk 61 is released. At this point, the distal disk 61 is partially deformed and the valve-component housing 50 is positioned at the level of the dysfunctional valve plane. Then, as the proximal segment 62 of the valve apparatus 10 is fully released, the positioning of the valve apparatus 10 is completed. In a further fourth embodiment, as shown in Figure 6, a valve apparatus 10 comprises a plurality of independent units, which may be hollowed, a valve component 30 generally located in the central portion 50 and at least two separate anchoring systems 20 or disks 60. When the insertion of the valve apparatus 10 is completed, the distal disks 61 are released. Even if not required, each distal disk 61 may comprise one or more additional anchoring structures allowing the sub-valvular to be anchored and positioned in regards to the distal disk 61. Upon deformation of the distal disk 61, the apparatus 10 is pulled back into the plane of the dysfunctional valve in order to position the valve component 30 located in the valve-component housing 50. The valve apparatus 10 is positioned into an expandable structure, such as a balloon. The expandable structure may be deployed following initial positioning of the valve apparatus 10. Once positioned, a second disk 62 is released in order to secure the entire apparatus 10 in place. The configuration of this embodiment may be changed or adapted according to the route of insertion, such as anterograde versus retrograde or percutaneous versus trans-apical versus trans-atrial. In a further fifth embodiment, as shown in Figure 7, a valve apparatus 10 comprises a plurality of wires 63 distributed in a way to form one or more disks 60, either distal 61 or proximal 62, and a valve component 30 generally located in the central portion 50. Each wire 63 may comprise an anchoring mechanism such as a hook or needle. When the insertion of the valve apparatus 10 is completed, the distal disk 61 is released. Upon deformation of the distal disk 61, the apparatus 10 is pulled back into the plane of the dysfunctional valve in order to position the valve component 30 located in the valve- component housing 50. Once positioned, a second disk 62 is released in order to secure the entire apparatus 10 in place. The configuration of this embodiment may be changed or adapted according to the route of insertion, such as anterograde versus retrograde or percutaneous versus trans-apical versus trans-atrial. In a further sixth embodiment, as depicted in Figure 3, a cage device comprises a single unit, wherein such unit may be hollowed, a valve component 30 generally located in the apparatus central portion 50 and at least two separate anchoring systems 20 or disks 60. Additionally, the distal anchoring system 20 may comprise two or more disks 60, referred as a multi-lobar disk. In this embodiment, the preferred shape or configuration of the distal disk is a cross-like or "star-like" structure. When the insertion of the entire device distally located in regard to the patient's dysfunctional valve is completed, the distal multi-lobar disk is distally released, in regard to the sub-valvular apparatus, between the junction chordae tendinea/papillary muscles in order to keep the subvalvular apparatus intact and to provide an optimal anchoring to the system. The distal disks 61 may comprise at least one additional anchoring structure 20, such as but not limited to needles, hooks, prongs, struts, helical configurations or any other fixation mechanisms. The anchoring structure 20 allows the sub-valvular anchoring and positioning of the distal disks 61. The addition of markers may be required to orient the apparatus 10 during the deployment of the apparatus 10. Upon deformation of the distal disks 61, the entire cage structure 40 is pulled back into the plane of the dysfunctional valve in order to position the new valve located in the valve-component housing 50. Once positioned, the proximal disk 62 is released in order to secure the entire cage in place. The configuration of this embodiment may be changed or adapted according to the route of insertion, such as anterograde versus retrograde or percutaneous versus trans-apical versus trans-atrial. c) at least one valve component attached within the valve-component housing. 2) The valve apparatus as described in claim 1, wherein the valve apparatus is constructed using tightly woven material. 3) The valve apparatus as described in claim 1 , wherein the valve apparatus is covered with interwoven material. 4) The self-positioning multi-disk valve apparatus as described in claim 1, where the said valve apparatus comprises an internal aperture allowing valve positioning. 6) The valve apparatus as described in claim 5, where the valve apparatus is constructed using a tightly woven configuration. 7) The valve apparatus as described in claim 5, where the valve apparatus is completely covered with interwoven material. 8) The valve apparatus as described in claim 5, where the caged frame comprises an internal aperture allowing valve placement. 10) The valve apparatus as described in claim 9 wherein said valve apparatus comprises a distal disk and a proximal disk and wherein said disks are independently constructed in a woven configuration. 1 1) The valve apparatus as described in claim 9, wherein said valve apparatus is covered with interwoven material. 12) The valve apparatus as described in claim 9, wherein said valve apparatus comprises an aperture allowing valve homing. 13) The valve apparatus as described in claim 9, wherein said valve apparatus comprises a balloon-shaped expandable valve structure within the valve-component housing segment. 14) The valve apparatus as described in claim 9, wherein said valve apparatus requires additional compression methods. 15) The valve apparatus cage as described in claims 1, 5 and 9, wherein the valve- component housing and a disk of said valve apparatus are self-deformed according the sub-valvular anatomy. 16) The valve apparatus cage as described in claims 5 and 9, wherein the valve-component housing and a distal disk of said valve apparatus are self-deformed according the sub- valvular anatomy. 17) The valve apparatus cage as described in claims 1, 5 and 9, wherein the valve- component housing is structurally independent from the at least one the proximal and distal disks. 18) The valve apparatus cage as described in claims 5 and 9, wherein the valve-component housing is structurally independent from the the proximal and distal disks. 19) The valve apparatus cage as described in claims 5 and 9, wherein the valve-component housing and distal disk of said valve apparatus are self-deformed according the sub- valvular anatomy. 20) The valve apparatus cage as described in claim 1, where the weaving use to build the caged frame is wider than the weaving of the valve-component housing. 21 ) The valve apparatus cage as described in claim 3, wherein the valve apparatus comprises different weaving width and wherein said different weaving provides different radial expansive forces. 22) The valve apparatus cage as described in claim 5, wherein the dimensions of the distal disk are inferior to the dimensions of the proximal disk. 23) The valve apparatus cage as described in claim 1, wherein the at least one disk conform to the peri-valvular anatomy of a patient. 24) The valve apparatus cage as described in claim 1, wherein the at least one disk contains additional anchoring mechanisms. 25) The valve apparatus cage as described in claim 1 , wherein the at least one disk comprises anchoring mechanisms. 26) The valve apparatus cage as described in claim 25, wherein the anchoring mechanisms are prongs, needles or hooks. 27) The valve apparatus cage as described in claims 1, 5 and 9, wherein the at least one disk has several shapes and configurations. 28) The valve apparatus cage as described in claims 5 and 9, wherein the at least one distal disk has several shapes and configurations. 29) The valve apparatus cage as described in claim 27, wherein the at least one disk comprises a marker specifically located to facilitate device placement. 30) The valve apparatus as described in claim 1, wherein the at least one disk and valve component housing are constructed from tubing material. 31) The valve apparatus as described in claim 1, wherein the at least one disk and valve component housing are constructed from sheet material and shaped into a generally cylindrical configuration. 32) The valve apparatus as described in claims 30 and 31, wherein the valve apparatus has a constrained shape and an expanded shape, wherein the expanded shape has a diameter superior to the diameter of the constrained shape. 33) The valve apparatus as described in claim 32, wherein the said valve apparatus is built with material having superelastic properties. 34) The valve apparatus as described in claim 33, wherein the material is nitinol. 35) The valve apparatus as described in claim 34, wherein the said valve apparatus has a shape memory configuration set in an expanded shape. 36) The valve apparatus as described in claim 35, wherein the said valve apparatus has the ability to be constrained to smaller diameter, and superelastically recover to a larger diameter. 37) The valve apparatus as described in claims 36, wherein the said valve apparatus comprises a proximal lobe and a distal lobe and wherein said lobes are formed by partially or completely inverting the ends of a cylindrical structure, such that the inner surface in the valve-component housing area is continuous with the outer surface of the said disks region. 38) The valve apparatus as described in claims 37, wherein the disks may be reverted to a cylindrical condition for purposes of constraining the cage to a smaller diameter. 39) The valve apparatus as described in claims 38, wherein the said valve apparatus has a constrained configuration wherein the disks are reverted and form a uniform cylindrical structure together with the valve-component housing. 40) The valve apparatus as described in claims 39, wherein the said valve apparatus is positioned within a catheter suitable for delivery inside a tubular passageway. ITRM20080019A1 (en) 2008-01-14 2009-07-15 Ballarati Anna Maria Container for a double stick movement with a single cup portastick.